Buy your Canon Scanners from ScanStore and our dedicated scanner experts will be there to help if you need us. Online feature comparisons, user reviews & live support chat. DR-6030C 62ppm Color Duplex 11x118"
P-215II scanner was designed to improve personal productivity and efficiency anywhere, from home offices, to classrooms, even traveling in between. It can help meet the document capture needs of stationary users and “road warriors” in healthcare, legal services, financial services, and many other areas. Users can conveniently execute general purpose distributed scanning tasks and help reduce paper in the process. DR-C240 30ppm Color Duplex 8.5x14"
Deliver high-speed and powerful performance to the office with the Canon imageFORMULA DR-M260 document scanner. 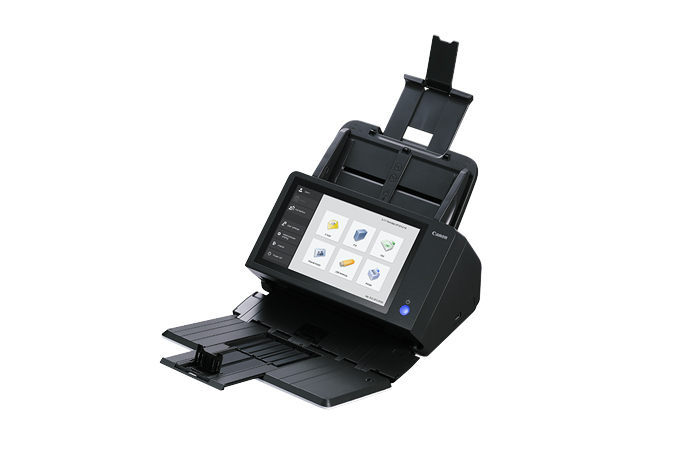 Its user-friendly design, high-quality image processing, reliable item handling, and robust software offer end-to-end options for capturing business information and improving workplace productivity. DR-M1060 40ppm Color Duplex 11.8x118"
DR-4010C 40ppm Color Duplex 8.5x14"
images from a single scan, in a variety of combinations: full-color, black-and-white, grayscale, binary or RGB color dropout, resulting in the ability to capture images for multiple applications at high speed. The DR-7080C ships standard with Canon's scanning software, CapturePerfect v3.0, a plug-and-play application that provides a choice of output formats for distributed workflows. Document Set Indicators for both flatbed and feeder modes visually alert users when documents are properly loaded and/or situated on the platen for scanning. technology enables you to generate multiple images in various combinations from a single scan. Simultaneous output of color, black & white, grayscale or color dropout images, offer unique capture flexibility. With Canon's advanced Contact Image Sensors and dual light sources, scanned images are captured with remarkable clarity and detail, while maintaining maximum throughput at high speed. The DR-9080C's high-capacity 500-sheet Automatic Document Feeder will self adjust automatically to each document size or thickness in a mixed batch. More info on Canon Scanners. This page was designed to help you find Canon Scanners quickly and easily. Click Here to find Canon Scanners. Click Here to find Canon Scanners.